The makers of the film starring Lady Gaga and Bradley Cooper and the world’s leading physicists are in agreement: stars are born, not made. Jacob Stockdale is one of very few players who have an innate star quality otherwise known as the X-factor or, as the French would say, ‘I don’t know what’. It is this indefinable characteristic which sets the top players apart from other mere mortals. It goes without saying that Jacob Stockdale has physical attributes and skill-levels shared by few others. Speed, guile, opportunism and strength are qualities which have made the Ulster winger one of the deadliest finishers in European rugby. However, it is Stockdale’s uninhibited style and pure enjoyment of the game –his joie de vivre – which has catapulted him to stardom and earned the admiration of rugby fans worldwide. One passage of play in particular, encapsulates Stockdale’s indefinable ‘otherness’. Against the All Blacks in Dublin back in November, Stockdale attempted an impudent chip over the head of Kieran Read. Unfortunately for Stockdale, Read reached out and charged it down. Maybe it was the collective intake of breath from the crowd at the Aviva that dislodged the ball from Read’s grasp or maybe the rugby gods were looking after Stockdale that day. Whatever the reason, Read bungled the ball and Stockdale and Ireland were let off the hook. The camera panned to Stockdale. Most players would have their head in their hands or would be muttering expletives at themselves. Stockdale had a wry smile on his face and apologetically held up his hand to his team-mates like he had just missed a sitter in a friendly game of 5-a-side. It is a truism that fortune favours the brave. To win, individual players must take calculated risks. In the upper echelons of modern rugby, defences are so well drilled they become almost impenetrable by conventional means. Teams therefore rely on certain players to step up, put their necks on the line and create try scoring opportunities. This requires courage. Indeed, moments later, Stockdale received the ball from a well-rehearsed backs move and proceeded to arc the ball over the onrushing All Blacks defence. This time, however, Stockdale gathered the kick and powered over the line to help secure a historic victory for Ireland. Stockdale has since replicated the famous “Stock-Chip” try for Ulster. In typically humble fashion, Stockdale attributes his try scoring success to ‘a few lucky bounces’. Of course, this does a disservice to his bravery, individual brilliance and ability to anticipate the notoriously unpredictable bounce of a rugby ball. As the saying goes, in rugby, you create your own luck. The pressure on Stockdale, as Ulster and Ireland’s most potent attacking threat, is immense. Last season, the Ulster wing was player of the tournament while setting a Six Nations record by scoring seven tries as Ireland sealed the Grand Slam. 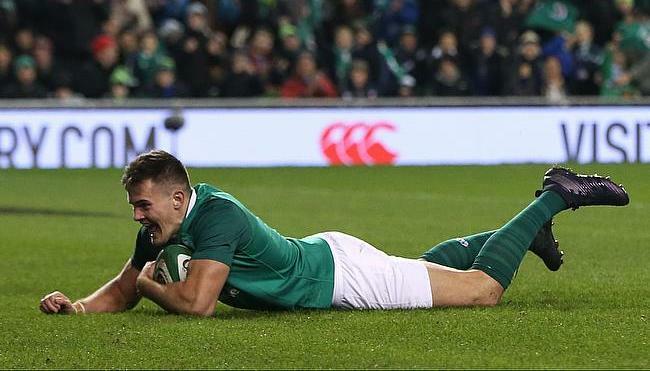 With the World Cup looming and big things expected of Ireland and Stockdale in the Six Nations, the weight of expectation must feel particularly heavy on his young shoulders. As joint-top scorer in the pool stages, @JacobStockdale could not be stopped in the #ChampionsCup ?? 6?? scorching scores for the @UlsterRugby man, and he's only 22 ???? On Saturday, Ireland were dismantled in Dublin by (it pains me to say this) an excellent English side. Let’s hope that, like when Father Ted kicked Bishop Brennan up the arse, this proverbial kick up the bum from England will provoke a similarly angry response. It was a particularly tough day at the office for Stockdale, who has received some unfair criticism for his role in one of England’s tries. When things don’t go to plan, Stockdale has so far demonstrated an unerring ability to take it on his chin and move on. Rather than carry psychological baggage around, Stockdale will thrive under the pressure of the need for a big performance against Scotland at the weekend. Looking further ahead, Stockdale is confident about Ireland’s World Cup hopes. Before this weekend’s game he will, as usual, distract himself by building Lego models – the type of DIY sports psychology that money can’t buy. Stockdale will play a key role in helping Ireland fit the pieces back together against Scotland as they seek to regain momentum ahead of the World Cup.